Cinnamon Sugar Snack Mix – One of my absolute weaknesses is a sweet and salty snack mix. This Cinnamon Sugar Snack Mix fit that bill. Who Wouldn’t Love a Cinnamon Sugar Snack Mix? Seriously, am I the only one who can inhale snack mix like it’s going out of style? Put a bowl of sweet or salty mix in front of me and it’ll disappear faster than my daughter when I tell her it’s time to clean her bathroom. And where there is sugar, there should be cinnamon. <–that should be a t-shirt or something. Let’s break down my favorite components of snack mix, shall we? First, there needs to be some crunchy components. My two favorites to use are pretzels and cereal. Both are great filler and add some great sweet and salty flavor. The third component to any good mix, IMO, are nuts. My favorite nuts to add are almonds. 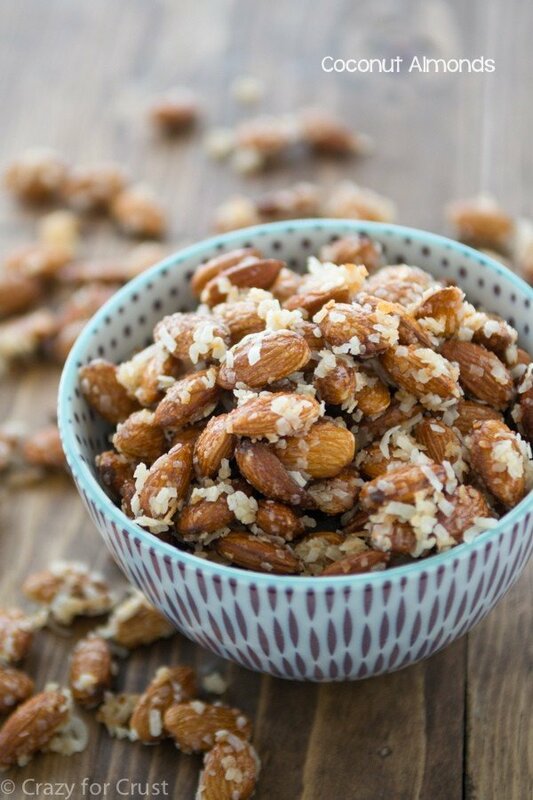 I could live on almonds – I eat them almost every day. For this mix I used Blue Diamond Almonds. They’re my favorite! I remember when I was a kid, my mom would go grocery shopping every week. She’d leave with her ads in hand, items circled, notes written in the margins. She’d come home an hour later, honk the horn, and we’d help her unload the bags and then the treasure hunting would begin. What fun things came home from the store??? My favorite weeks were when the small cans of Blue Diamond Almonds made an appearance. My dad and I would attack the can and it would be gone in no time. Then we’d be sad, because we’d have to wait a whole week before shopping day came again. Luckily I do my own shopping now so I can buy almonds whenever I want. 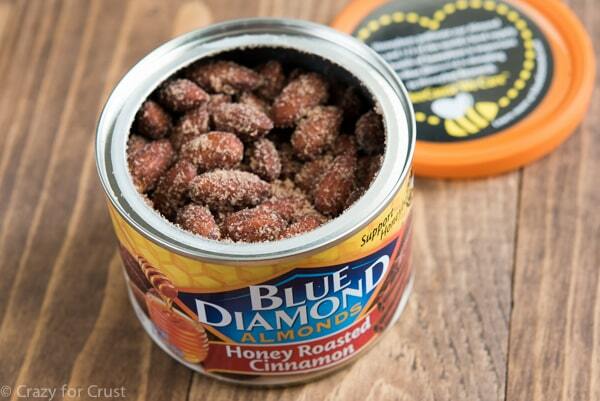 And Blue Diamond makes fun flavored almonds, like Honey Roasted Cinnamon. You guys, I almost had no more almonds to put in this mix because I was inhaling them so fast. You know those cinnamon sugar almonds they sell at the fair? The ones that come in cones? These taste like those, without all the coating. Seriously. And they sell them at the grocery store! Anyway, the Honey Roasted Cinnamon Almonds are the perfect addition to this Cinnamon Sugar Snack Mix. This mix is also super easy to make and way easier to eat. You simply toss pretzels and cereal pieces (I used Cinnamon Chex) with melted butter and cinnamon sugar. Then you bake the mix for about 18 minutes, stirring after 10. Let it cool then add the almonds and M&Ms and you have a mix everyone will love. This Cinnamon Sugar Snack Mix is kind of a like a churro. Only better. 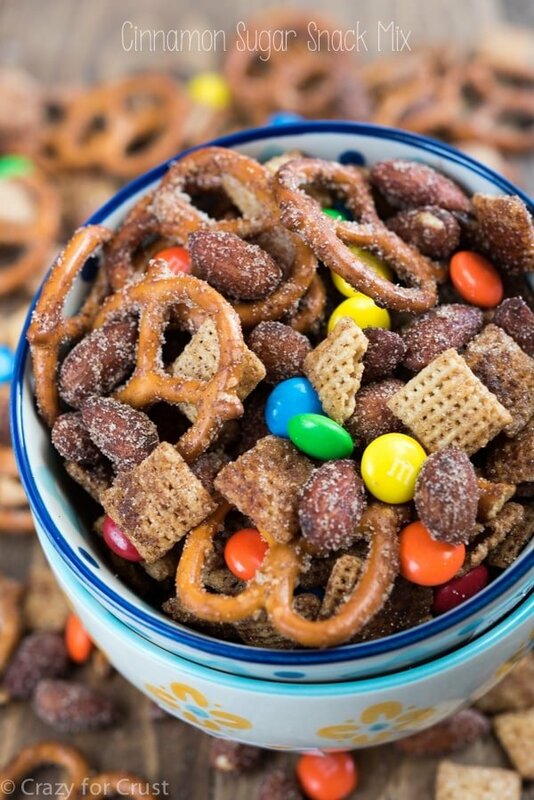 This Cinnamon Sugar Snack Mix would be perfect for a party, a bake sale, or a road trip. Or a random Tuesday. <–Definitely that. The cinnamon and sugar mixed with the salty pretzels and the sweet cereal is fantastic, especially with the almonds and candy! What do you love in your snack mix? 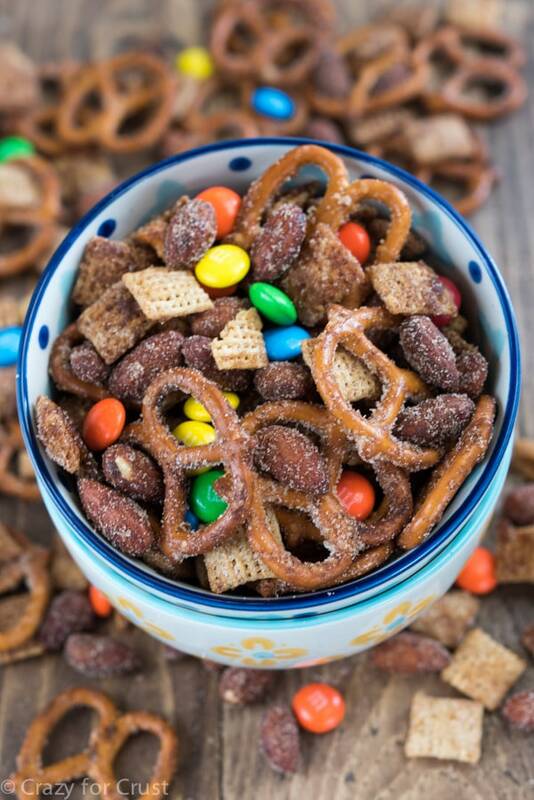 This snack mix has it all: cereal, pretzels, almonds, candy and cinnamon sugar! 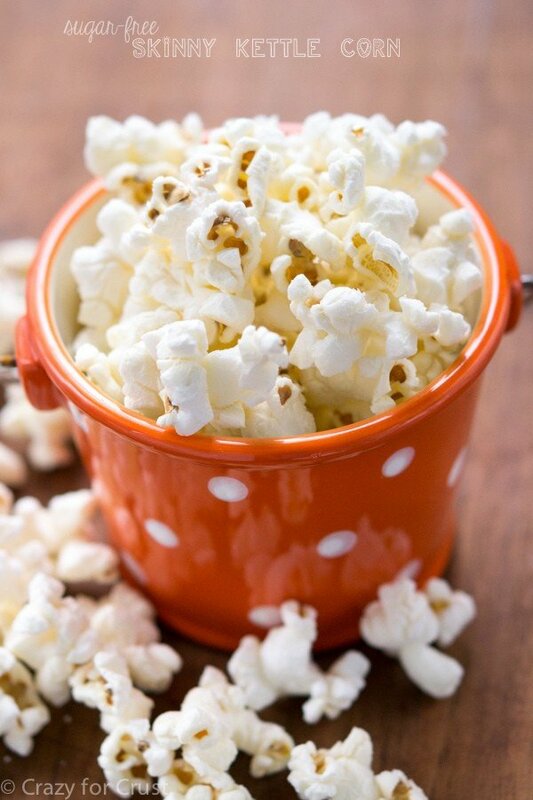 It's easy, fast, and is a great snack! Place melted butter in a large bowl. Add pretzels and cereal, toss to coat. Add sugar and cinnamon, toss again to coat. Pour onto prepared cookie sheet. Bake for 18-20 minutes, stirring after 10. Let cool. Once the mix is cool, toss with M&Ms and almonds. Store in an airtight container for up to 7 days. This looks addictive! It would be perfect to take to a game night, though, because I would have a lot of help eating it. And it is such a pretty snack! Yum! But seriously though, who’s idea was it to start putting raisins into perfectly good trail mix? 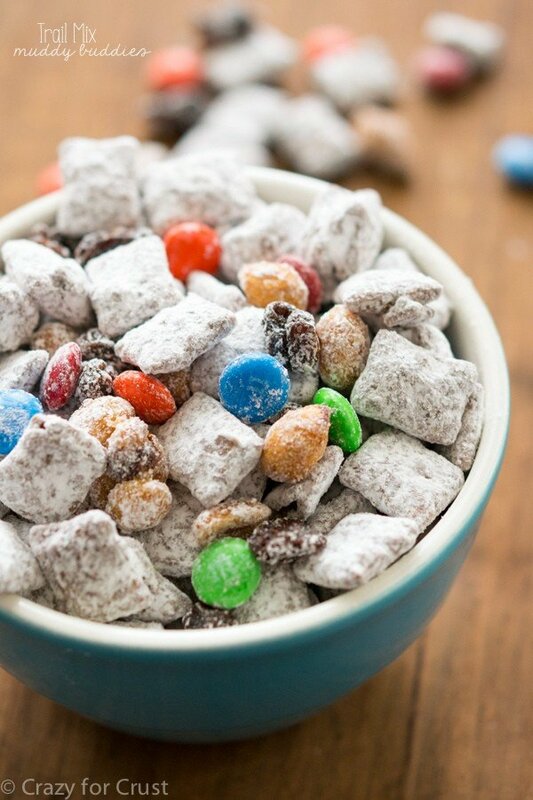 This looks amazing and now I’m sad that every trail mix ever isn’t cinnamon coated. Wouldn’t that be so good? I would hike for days. LMAO! Glad it’s not just me! This is definitely my kind of snack mix with sugar and cinnamon. It includes some of my favorite things…I’m a big almond lover too! Totally dangerous! I’m thinking smoked almonds here…. Thanks for sharing! Thank you! Smoked almonds would be awesome. Blue Diamond makes those too! You know what I always wondered? Why do they call it “snack” mix? Really, it should be named “the only thing I will eat today, so basically a meal” mix amIright? LOVE this cinnamon sugar goodness! Pinned! Oh my gosh yes. I should be called “meal mix” because I eat it as a meal! Thanks for the pin Taylor! oh. my. goodness. This mix looks deadly! I’m a major sugar addict too so I’d be glad to make a big bowl of this and slowly, but surely, end up eating the whole thing! Sweet and salty snack mix is totally my obsession! Love that this one is cinnamon sugar flavored! Pinned! There isn’t anything better than a sweet & salty combo. I love this recipe x 1000! Gosh, do I love sweet and salty combo too! They are the best! I could devour this in a hot minute!